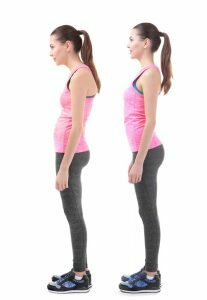 Postural therapy is an approach based on the idea that poor posture can shorten some muscles and lengthen others. Combined with muscular tightness and weakness, this can lead to chronic or acute pain and loss of optimal function. Postural therapy begins with a postural analysis, which is primarily used by chiropractors and sports medicine practitioners to examine the body’s structural integration and look for muscular or joint imbalance. Once she has made a diagnosis, she will develop a treatment plan to address the root of the complaint, be it joint dysfunction, core muscle weakness, short leg, scoliosis, a muscle imbalance, strain, or sprain. The treatment might include chiropractic manipulation, soft tissue work such as massage, activity modification with an emphasis on proper ergonomics, and/or rehabilitative exercise.